Distance bicycled: 1204 km (753 miles). Distance in truck due to shifter breakdown: 30 km (19 miles). Time Bicycling: 77 hours, 37 minutes. How polite drivers were when passing us. Coming back into Ottawa discovering just how impatient and bike-unfriendly drivers are here compared to everywhere else we cycled. How friendly and curious people were about us and our weird bikes. The lack of response when we waved or said hello to people on the Niagara-on-the-Lake bike path felt unfriendly – especially compared to the smiles and waves we always got in New York State. How few places there were to get food / provisions along the route – especially the lack of places to get ice cream There were always places to get things, I just expected to have more choice about where to get lunch or groceries. Took day 2 as a rest day. Even though it put us behind schedule, it was really necessary. Re-adjusted the weight such that Scott was carrying more of the load after day 1. Took lots of pictures from the bike while riding. Take more pictures of the people we met and the places we stopped. Stuffing my camera in a pannier meant that I took very few pictures. I need to find another way to carry a camera so it’s easy to get at while on the bike for quick pictures. 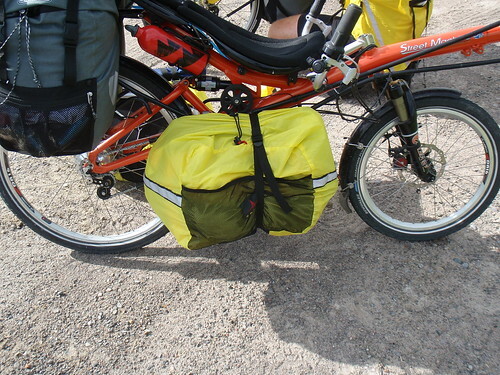 Don’t use Arkel RT-40 panniers on the underseat rack of a StreetMachine. They’re fine for normal riding, but will drag around turns, and catch. (Although Becky’s idea of putting a strap around each bag worked well once she thought of it around day 14). They aren’t really intended for this, although Arkel is planning to add a plastic stiffener to the bottom of the bags. Make sure there’s enough time to take rest days when needed, especially early in the trip. There’s a great article in Adventure Cyclist this month called Liftoff, talking about the pull of gravity keeping you at home while you do the last few things getting ready for a trip. We were running like mad trying to get ready before leaving on this trip, and I’m sure it will be the same for the next one. Having a planned rest day on Day 2 or Day 3 allows us to get away and then decompress a bit. Carry less food. We ended up returning home with most of the provisions we carried. Our riding diets are influenced by our needs and desires for a given day, so it is better to not carry so much and just adapt to circumstances (when communities and food are readily available – for Labrador, we will need to carry 2-3 days worth of food when we ride to Cartwright). Not make coffee while camping. I’ll change my morning routine to involve a cup of tea rather than coffee and save coffee for when we eat out. Coffee while camping is messy and requires special equipment that just isn’t worth it. Find some bike shorts. I rode most of this trip with capri pants, which are nice for casual rides but have chafing issues for long rides. I need to find some good biking shorts that don’t feel like diapers! Not use the cell phone in the US. The cost of roaming is $1 per minute plus long distance. We’ll need to get setup on Skype. Add sugar to the food list. We carry a non-sweetened sports drink powder which works well when added to Orange Juice; however, when OJ is not available and you need the hydration some sugar makes the drink more palatable and effective.